Love to barbecue? Then, the Blackstone 36 in Flat Top Griddle Station 4 Burner is for you! Seriously, I decided to write up a review on the griddle because it truly is a great product. I am an avid BBQ’er that spends nearly every week with my grill/griddle! There are so many benefits to this griddle, that personally I feel it belongs on every patio. Not only is this a great griddle but also can be used as a flat-top grill for those who like their burgers a little more greasy. One thing I love about these griddle/grill appliances is that you can work wonders with Teppanyaki style foods. Oh yeah, if you like Japanese cuisine you’ll really like this bad-boy of a griddle! Maybe that is why it is currently (at time of writing) a #1 Best Seller in “Grill Griddles” on Amazon! You’ll go from amateur to pro in no time with the Blackstone Griddle. 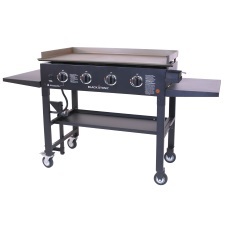 Top of the list, the griddle offers 720 square inches of flat top grilling – perfect for a rib cookout! Best yet, it’s great for any meal, bacon, and eggs for breakfast, grilled cheese for lunch and meat and potatoes for dinner. The griddle offers convenience with two side shelves and a bottom shelf for food storage and preparation. Like cast iron, the more you cook it, the more flavorful the food. The Blackstone Griddle offers four 15,000 BTU stainless steel burners that are independently controlled and equal 60,000 BTU’s with controls low to high, offering diversity for just the right temperature. The griddle is propane fueled with tank storage on the side shelf. Going on a picnic or camping? The Blackstone Griddle/Grill will transport easily; just fold down the legs and shelves put in your vehicle and off you go. Perfect for family outings too. The ratings are impressive. As for the lower ratings, a few of them have mentioned the grease tends to get clogged. A few of the consumers that have purchased the griddle have also complained about the ignition switch not working properly. However, overall the majority of verified purchasers liked it and rated this griddle high with a total of 4.4 Stars out of 5 on Amazon. Like most of the consumers that left an Amazon review for the Blackstone Flat Top Griddle Station 4 burner, you will be just as pleased with your griddle by Blackstone. The griddle is not just a tool for the weekend warrior that loves to whip up ribs and Franks, but also a tool for cooking breakfast, lunch, and dinner. The griddle is highly rated and has the features that allow for great cooking along with plenty of cooking area.